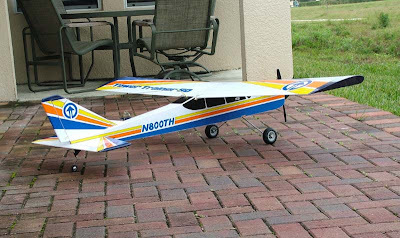 Jay McMullan's RC Aircraft Blog: Here We Go Again! Well, things have certainly changed since my last post. I moved to Orlando, Florida in December of 2008 and got married in March 2009. Since I have been here, I have not flown. For some reason the bug bit me again. I have a Bridi Dirty Birdy that I built while I was still in Salt Lake City. I flew it one time but had a couple problems. First, the retractable nose gear linkage came loose just as I pulled back on the stick. I was able to get the plane into the air but it was very nose heavy. It was my fault, I checked the center of gravity in the wrong place. All of you experienced pilots know that it is better for a plane to be a little nose heavy than to be tail heavy but I really had to keep my speed up to keep the nose up on the plane. About five minutes into the flight, the engine died and I came in deadstick but couldn't make the runway so I put it down in the grass. The wing ripped off but the only damage was one of the two dowels that attaches the wing's leading edge. I haven't touched the plane since and that has to have been almost three years ago. I pulled the plane out of the garage the other day and cleaned it up. I got the nose gear hooked up again and made some adjustments on the servo throws. I fixed the dowel on the wing. I also found that one of the head bolts on the Supertiger .90 had vibrated out. A quick trip to the hobby shop and that was fixed. Also, the carburetor had seized up, so I pulled the engine out of the plane and fixed that. If it flies anything like any other Bridi airplane it will be a nice flyer. It is powered by a Supertiger .90 which should be plenty of power. Power should not be an issue here in Florida when I am flying right at sea level. In Utah, we flew at right around 4,000 feet above sea level. Where I grew up in Texas, the elevation was 3,000 feet. The lowest altitude I have ever flown in was at Vegas and it was around 2,000 feet asl. I am really excited to see how things fly here. I am sure the planes will fly slower and land slower. 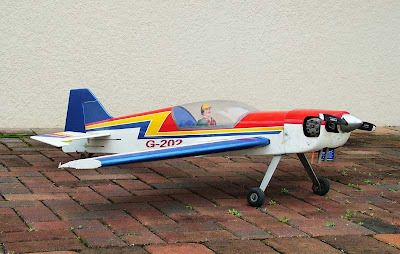 I have a Phoenix Models Giles 202 that I have flown quite a bit. The plane is one of the Vietnamese ARFs that is on the market. The plane is well built but comes with terrible instructions. The tank that is supplied with the kit is way too small too. As far as flying, it is definitely NOT a beginner's plane. The rolls, on high rates, are blazingly fast! I have never seen anything roll like this plane. Sometimes I am afraid I will rip the wing right off of the fuselage in a quick snap roll so I do the snap rolls more like a full scale plane, slow down, then snap it. To land this thing, you have to come in under power and really grease it in! Don't worry about this plane floating! Instead of the recommended .46 sized engine, I loaded the Giles with an O.S. .61. That was mainly due to the elevation in Salt Lake City. We'll see what it does here at sea level. Both planes fared well on my 2,500 mile trip. The covering is scuffed badly in spots but I can live with that. There were no punctures to the covering at all and I was very surprised about that. I would like to find a free place to fly, at least to test fly this Dirty Birdy, but it looks like I am going to have to join a club. The closest one to me and the only paved modelport in Central Florida is Tangerine Field. Bob Violet, owner of BVM Jets does all of his jet testing at this field because the runway is 750 feet long! Cost to join Remote Control Association of Central Florida is $160 a year which is not too bad. 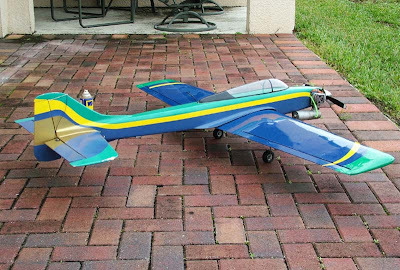 I also have to rejoin the Academy of Model Aeronautics since I let my membership lapse. Cost for that is $58 per year. I remember flying off of cow pastures and just about any place that was flat in the Texas Panhandle. In Salt Lake, we had the Utah Modelport which was a pretty nice paved runway and a state park plus we had a salt flat near Grantsville, Utah that was free to fly off of. I will post photos of both planes soon.